The GH4 is being billed as the world’s first digital single-lens mirrorless (DSLM) camera to record high-resolution 4K video. It’s aimed at addressing the lack of mass-market tools that can produce content for 4K TVs. Housed in a dustproof magnesium alloy frame, the GH4’s 16.05-megapixel sensor has a faster signal readout rate than the previous model and an enhanced dynamic range. It’s got a quad-core CPU that can shoot bursts of still images at 12 frames per second, with low light level performance up to 25,600 ISO. But recording best-quality, 4:2:2/10-bit 4K video with the GH4 requires the use of Panasonic’s powered DMW-YAGH Interface Unit and an external recorder. The GH4 follows the announcement a month ago at CES of Sony’s palm-sized 4K Handycam, the FDR-AX100, which will retail in March for about $2,000. 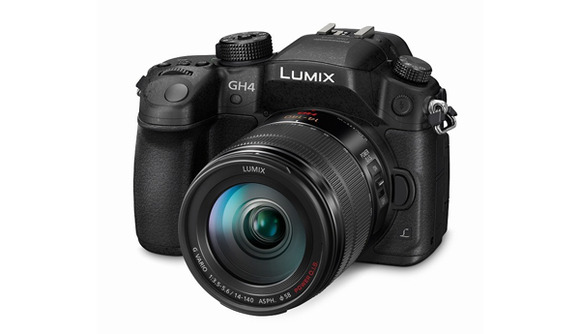 While Panasonic hasn’t announced a price for the GH4, it could go for under $2,000. Its predecessor, the 16-megapixel Lumix GH3 announced in 2012, carried a MSRP (manufacturer’s suggested retail price) of $1,300 for the body only. It featured built-in Wi-Fi, a new sensor, and a quicker autofocus speed of 0.07 second.